Notes: Written by Mike Munford and performed by Frank Solivan and Dirty Kitchen. 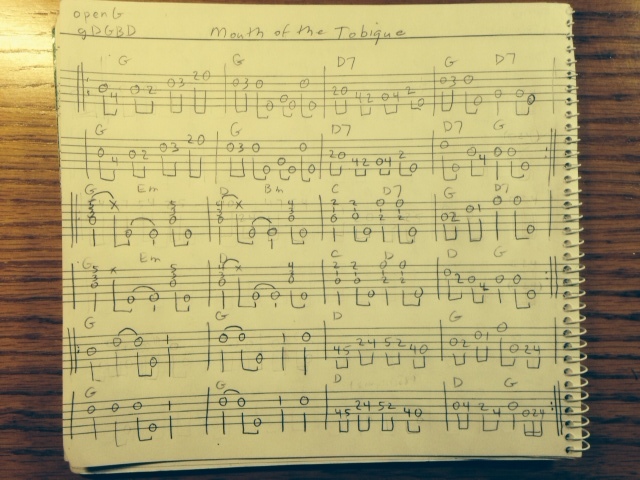 Notes: This is an improved rendering of the version played on the Frank Solivan and Dirty Kitchen recording. Notes: Played in thumb-lead, two-finger style. Notes: Arranged for 2-finger index-lead, but would work well as straight clawhammer too. Notes: Tab provided with the guidance of Erynn Marshall and Carl Jones. 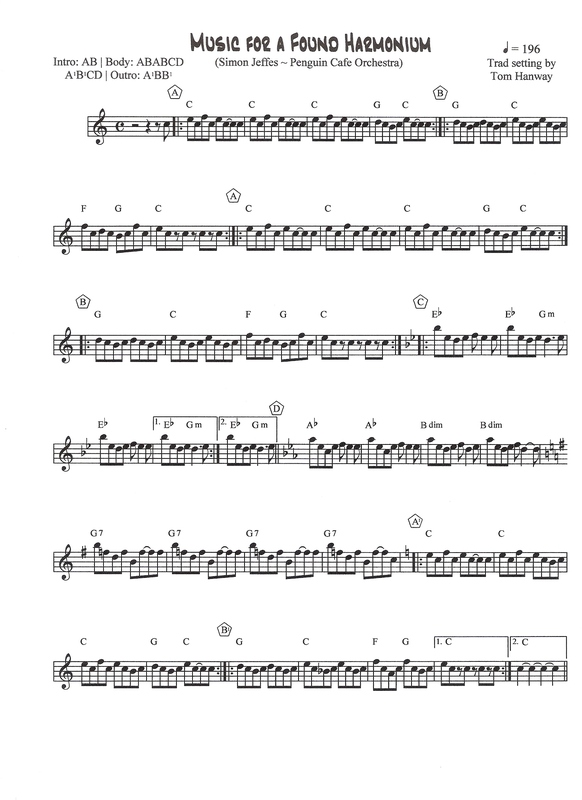 Notes: A nice Slip Jig edited from the O' Neill's Music of Ireland #1168. Double C tuning. Easy left hand positions. Notes: The A part is quite easy, but the B part I found tricky - getting the high 'b' and keeping the pedal going. I've tried to arrange the B part to make the left-hand fretting as efficient as possible so that it can be played at 'session speed'! I shift (left hand) position on the open strings at the last beat of the 1st bar, after first beat of 2nd bar, last beat of 2nd bar, 2nd beat of third bar (going to a half bar on the 9th fret) etc. Notes: A classic Irish reel. Adapted in double C capoed 2. I love it ! Notes: Here is an almost bare bones arrangement (standard notation) for the traditional reel in D major. Notice how I use an F# in spots (not the usual B-note). I've also changed a commonly played triplet (B-part) to two 16th notes followed by an 8th note, which has more punch, less bounce, than the triplet. It's called a "treble" no matter how it is notated. 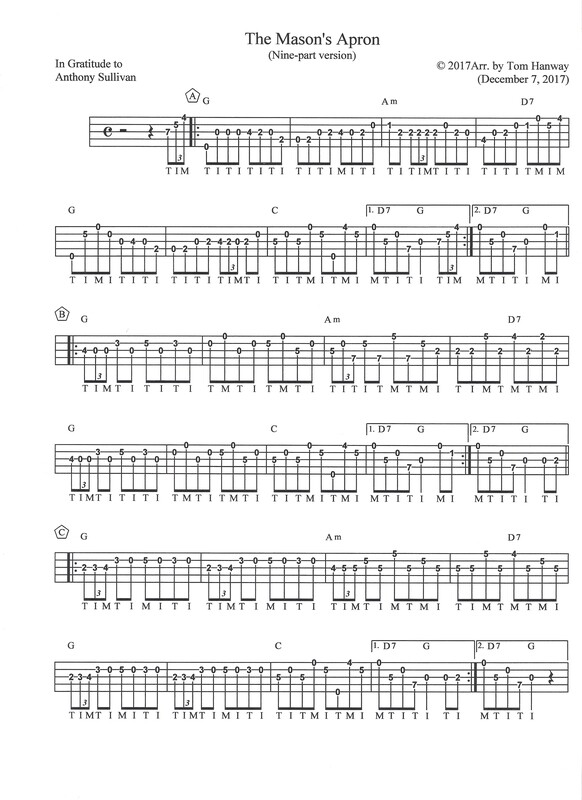 Notes: Major scale maps for the complete 22 fret fingerboard. Notes: Ascending scales with all possible fingerings; all major scales. 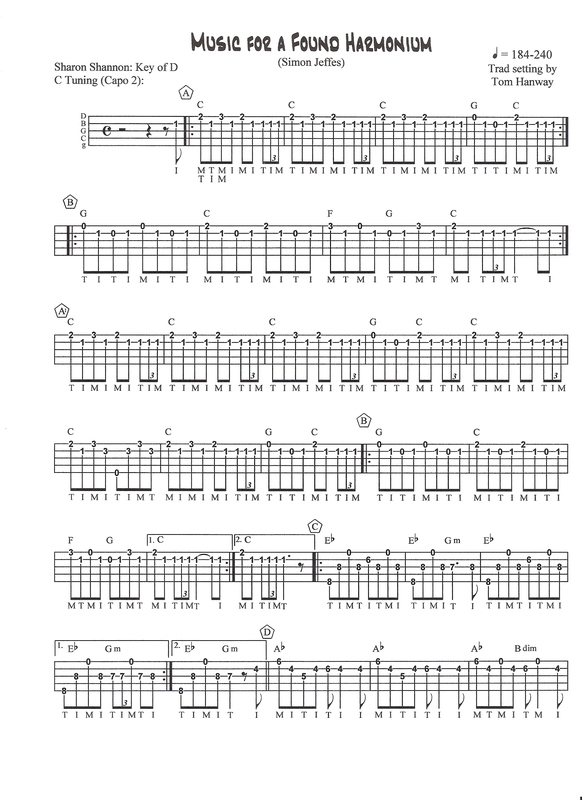 Notes: Here is a sample tab of the G major scale and C major scale for banjo. The question of scales comes up often, so this demonstrates my approach to teaching scales. You may play scales on single strings. However, that doesn't have much practical application for bluegrass playing. The idea is to play rolls, so, I believe scales should be practiced that way. Here is the simple rule to follow: never play the same string twice in a row; never use the same finger twice in a row. Notes: This is an old Swedish song by the troubadoure Carl Michael Bellman. It was composed around 1790. Here played in clawhammer style. Notes: a fun tune for everyone to take a break on! Notes: This is in the style of the music from the movie "O brother where art thou". Notes: Playing style would be Ralph Stanley but that wasn't a choice! Notes: Tabbed a version of "I have (I've got) a mansion just over the hilltop. It's played in the key of C (C-F-G) with the banjo tuned to G. Capo 2 and your playing in D. This is 3-finger Scruggs style and is played relatively slow (I've embedded a Ricky Van Shelton Youtube version) and included lyrics. Notes: Text window must be maximized for easiest viewing. Notes: the song goes out of the banjos low register, but who cares. its sure fun to pick! Notes: Marching Through Georgia was written by Henry Clay Work in 1865 to celebrate the Union "March to the Sea" led U.S. Major General William Tecumseh Sherman from November 15, 1864 to December 21, 1864 culminating in the capture of the Port of Savannah. Mark recorded Marching Through Georgia with Emory Lester for the CD, Acoustic Rising, released on the Mountain Home label in 2006. On the CD, Mark told me, he placed a capo on the 5th fret of his banjo tuned in double C (gCGCD) raising the banjo's pitch to the key of F. To make my job of transcribing this tune into tab easier, I asked Mark to play without the capo. Notes: A modern favorite Christmas tune written by Mark Lowrey with variations for each verse. A haunting but beautiful song and arrangement, enjoy. Notes: This is my version of the theme from M*A*S*H, also called "Suicide is Painless". I is in the key Bm, which seems to fit better than than you expect. Notes: Based on tfaux's (thanks) tabbed/played version but in A. Notes: In gratitude to Mike Keyes. 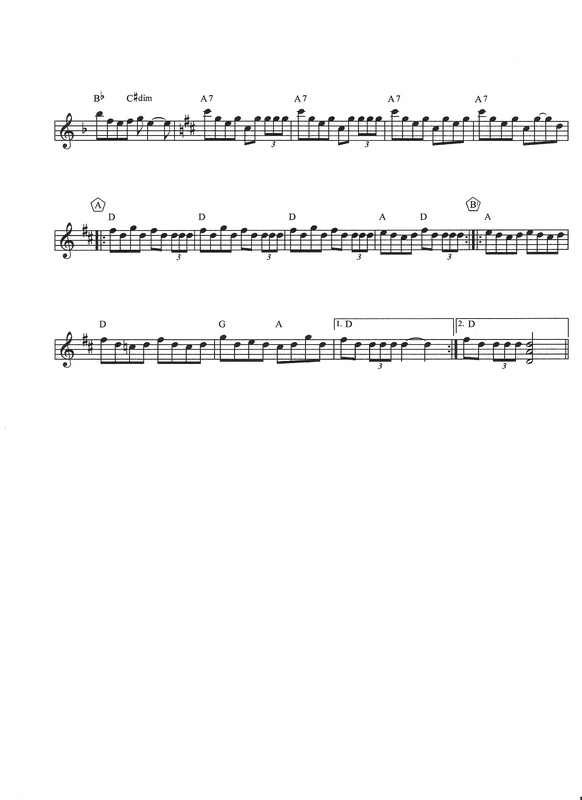 This version (G) is based on Micho Russell's (Co. Clare) tin whistle version in F.
Notes: This Irish fingerstyle version (G) is based on Micho Russell's (Co. Clare) tin whistle version in F. It has a bit of a lilt to it, and is not played too fast. It's a laid-back two-part version that can stand on its own or go with other tunes. Notes: Here is a nine-part-contest version of the famous Scottish reel—not for the faint of heart. I have it in G, but obviously, it can be capoed to A. 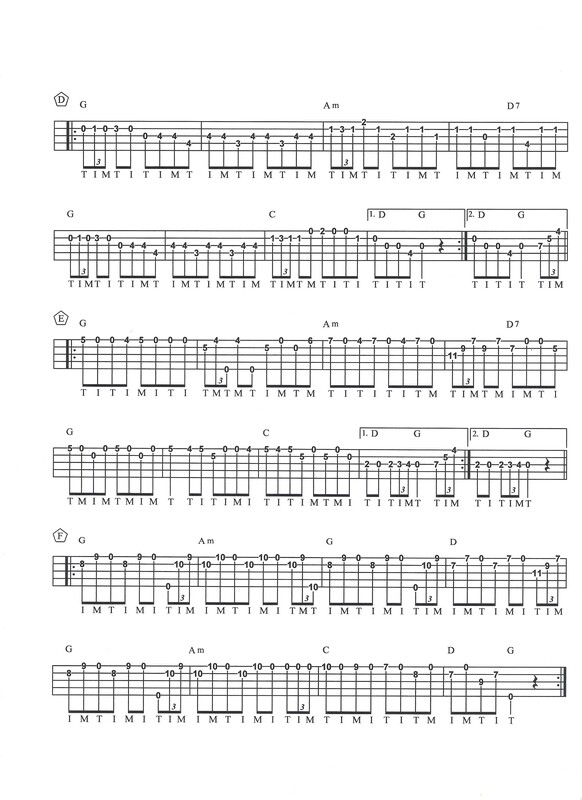 These are advanced Irish fingerstyle variations (G tuning) that use ornamentation in the form of triplets, inspired by legend Anthony Sullivan, who pioneered 4-string variations in A (GDAE tuning). In that same spirit, I have added (optional) chords and a fancy ending that is reminiscent of frenzied fiddlers bringing the tune home. One doesn't have to play all nine parts, and they can be combined and re-combined to suit one's taste; in other words, make this tune as long or as short as you want. Notes: This is my transcription of the Country Gentlemen's "Matterhorn". For some reason it felt wrong to me to write everything relative to 0 when capoed this high. Hence, open strings appear as "8" and what is e.g. the 2nd fret relative to the capo is notated as "10" and so on. Notes: Tab with lyrics included. No solo's tabbed out from the song. Notes: From Christy Moore's group "Moving Hearts" and later covered by Canadian group "Leahy"
Notes: An original tune by Alice Gerrard who collected songs and played with old-time Virginia musicians. Notes: From the playing of Kentucky fiddler Jake Phelps. I've posted Merriweather in two different tunings (and have seen more than two different spellings of her name!). Notes: Electronic song transposed to the banjo? Notes: Very popular session English session tune. Notes: Here's a fairly easy arrangement of a Beatles classic in a chord melody style. The verse is in D and the chorus is in Dm. Don't let the chord names scare you, they're mostly two or three note shapes, with not too many big stretches. Hope you enjoy it! 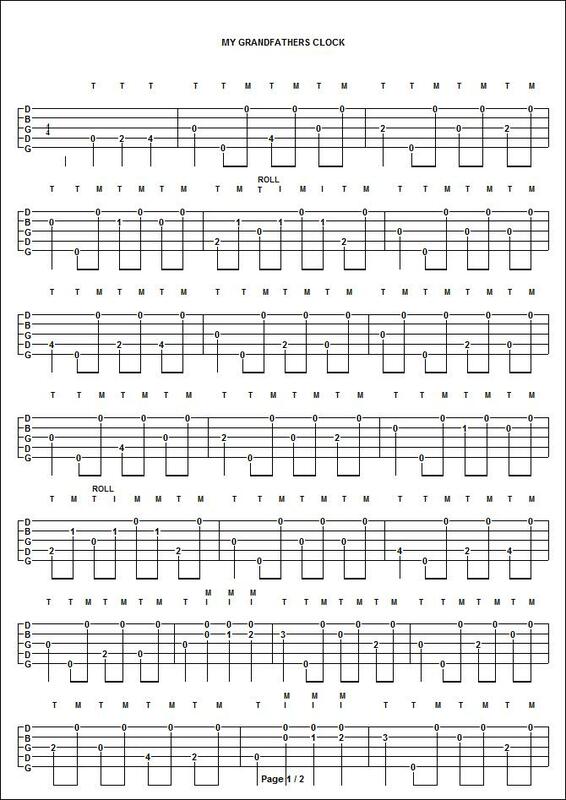 Notes: Done in the style of the Eagles recording, this tab combines the first and second banjos of Bernie Leadon's studio playing. Notes: Don Borchelt posted a lovely arrangement of this song a while back. Always good to have several versions to choose from, dontcha think? This arrangement is a little simpler than Don's and should be easier for newer players to grasp. Notes: Transcribed from Poison Lies volume 4. Notes: Played 3 finger (not Scruggs). Includes three slightly different versions of the song. Notes: Mighty Dark to Travel as played by Charlie Cushman on this YouTube video. (http://www.youtube.com/watch?v=AJE3Vf4_2I0) If you notice something wrong with the tab, please let me know. Tabbed by Tabito (no pun intended). Notes: From the fiddling of John Morgan Salyer. Notes: This is an original piece I wrote for a friend's movie. It uses some drop-thumbing as well as some plucks on the open 1st string to fill in the gaps. I also included standard notation, in which the ties show hammer-ons or pull-offs. Enjoy! Notes: As played by Don Stover and by J. D. Crowe. Notes: This music is a brazilian southern one, from the genre Milonga, also popular at Uruguay, Paraguay and Argentina. 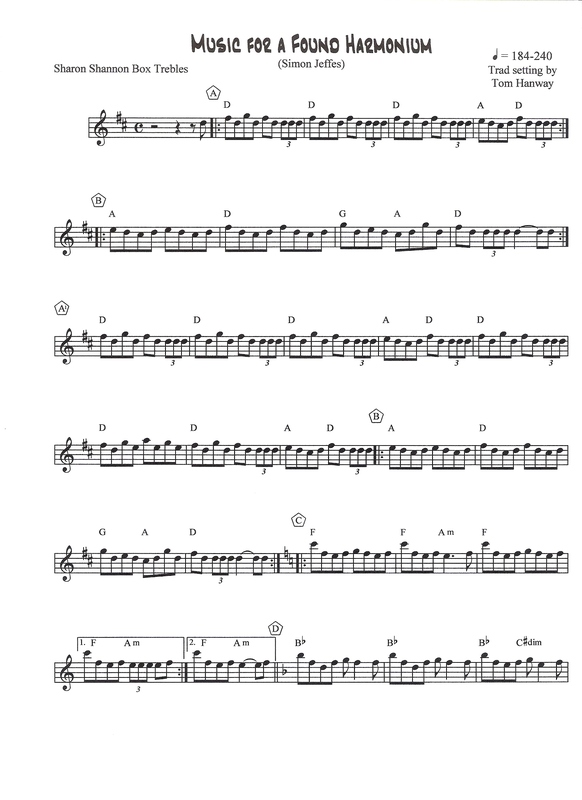 It is originaly for accordeon, but I did an arrange for banjo. Notes: This is my try at transcribing Django Rheinhardt note for note onto the banjo. A good learning experience. First 2 rounds of Minor Swing in Am. Standard tuning with 5th string capo'd to A. mp3 on my music page. Notes: This piece by English composer Henry Purcell (1659-1695) is easy to play. Notes: This is another minuet in G from the Anna Magdalena notebook. Notes: An arrangement for clawhammer banjo of a tune found in an 18th century Welsh fiddler's manuscript. This tune is #51 in "Alawon John Thomas," a modern edition of the manuscript. Edited by Dr. Cass Meurig. 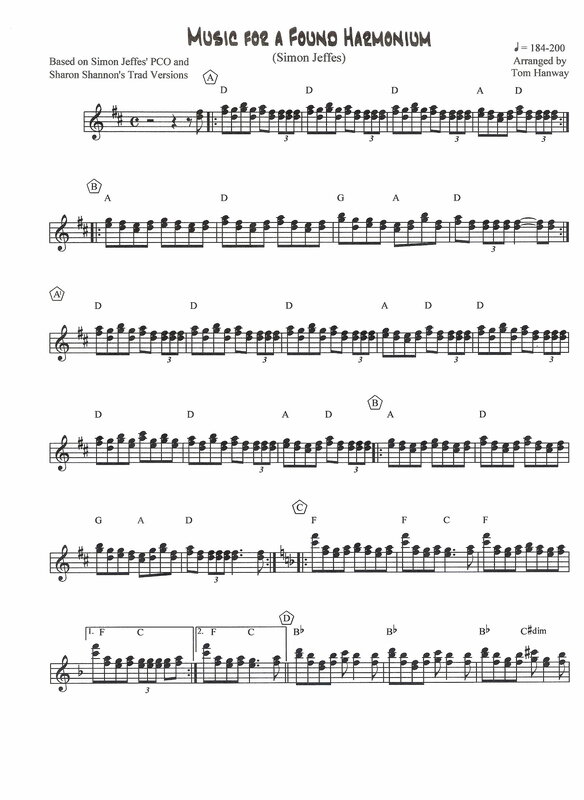 This tune is most likely John Thomas's interpretation of a minuet written by Jean-Claude Leclair. Notes: This is the famous minuet usually ascribed to Bach and it is found in the Anna Magdalena notebook. However, nowadays it is usually attributed to Christian Petzold. Thanks to Liam (Bilbo 1) for that information. You can see me playing this in my videos, but without the guitar accompaniment. Notes: Duet clawhammer arrangement of a Bach minuet, in G.
Notes: This is another minuet from the Bach Anna Magdalena notebook. However, it now looks as if it was by Christian Petzold as a companion piece to the popular minuet in G major. Notes: This tune was written by Hilarie Burhans and Jane Rothfield. Janet Burton has very generously edited my hand written tab and converted it to tef and pdf. Notes: The two ladies who wrote this tune contributed an A part (Hilarie Burhans) and the B part (Jane Rothfield). A beautiful tune and an old-time Tune of the Week. Notes: An edit of Dan Levenson's Kitchen Sink arrangement. 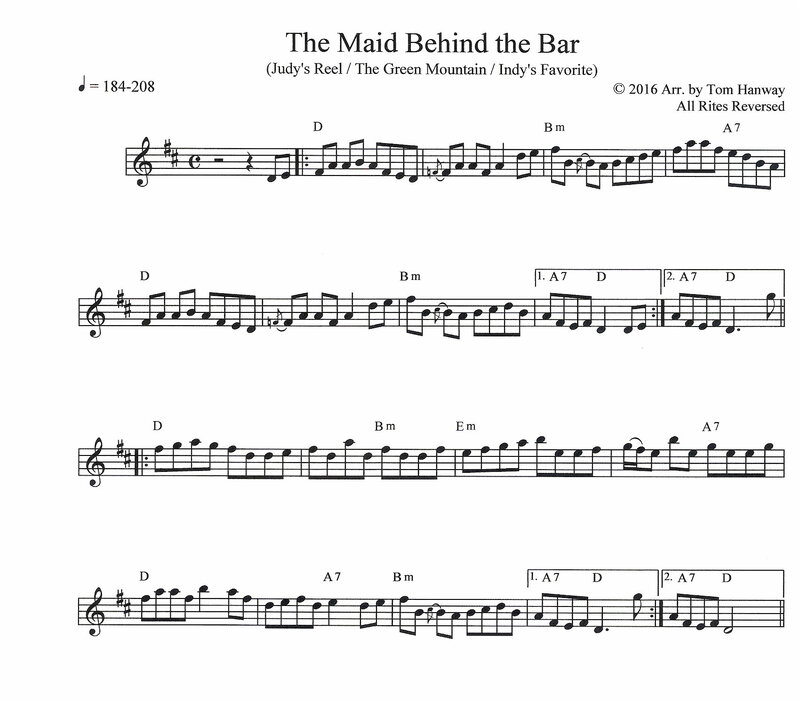 Notes: Fiddle tune by Kenny Baker in key of Bb. Great tune that I've never heard anyone play. Hopefully this will spur someone on. The PDF files are for page 1 and 2. Notes: Based on the playing of Mark Casstevens, this is the banjo arrangement from the Ray Stevens recording. You'll need to capo all the way up to the 7th fret to match the recording. Notes: M&T is a traditional song that Bill Monroe arranged and made his own. A number of great banjo players have tackled it: Earl Scruggs, Don Stover, Bill Keith, Craig Smith, J. D. Crowe, Lamar Grier, and the list goes on. I have tabbed out 3 breaks, 2 down the neck and 1 up the neck (a la Don Stover). Have fun. Notes: Mark Knopfler's intro to Money for nothing. Sounds really cool on banjo. Notes: This is from Briggs' Banjo Instructor, published in 1855. In the original notation the banjo was tuned dGDF#A, and the tune was played i D major. 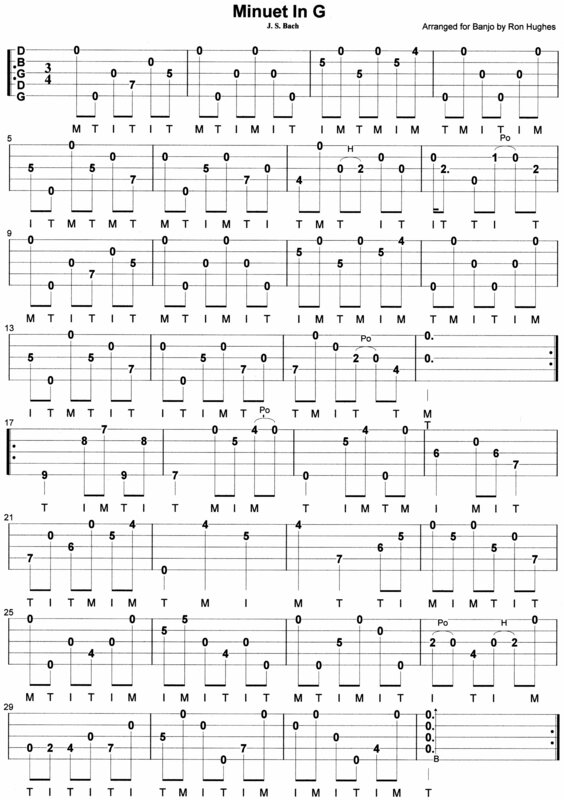 I have transcribed it to aEAC#E (standard G tuning with capo on second fret) to play in the key of A, which seems to be the most common key for other versions of Money Musk. Notes: This is the melody only to the tune Monique which can be found on my page. Tabbed out by my good friend winnipegbanjoman (Nestor). Notes: Two of the midi files are for "play along" to help with your timing while practicing the tune (one at 90 bpm and the other at 120 bpm). 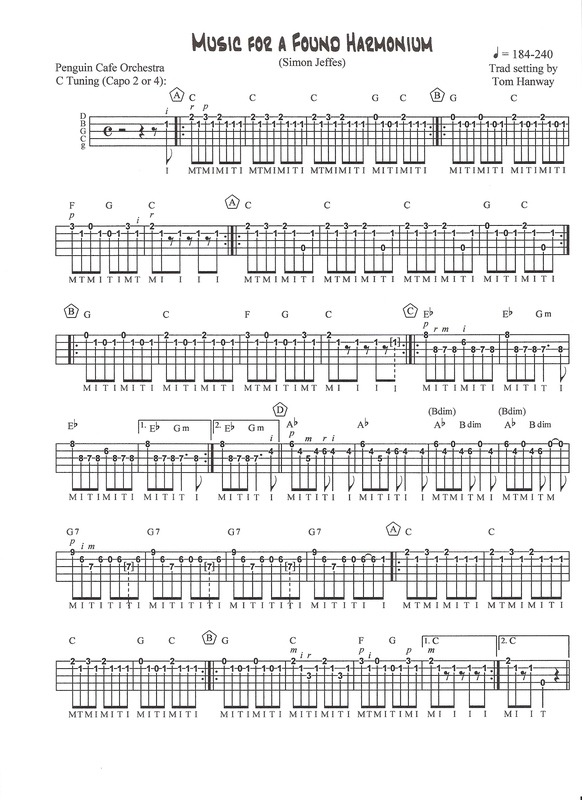 Notes: This is another classic fiddle tune written by Bill Monroe that is an excellent vehicle for the banjo. I have tabbed out a relatively straightforward arrangement with nothing too flamboyant. I included two versions of the B part, the first up the neck and the second down low. Both work well, but I have found that the second is easier to play when poor lighting on stage prevents me from seeing the position markers on the neck. Notes: Noam Pikelny's melodic version of this Kenny Baker classic. Notes: My short simple modest attempt at a great piece of music. If you have something better please post it. Notes: This is a transcription of Beethovens Sonata No. 14 "Moonligh" Op. 27, No. 2. The original piano version contains a bass line, a triplet accompaniment, and a simple melody line. This is the "triplet accompaniment and melody" transcribed to banjo, in the original key C# minor. Notes: Dance tune from the North of England. Notes: The "Other" playing style is three-finger melodic. Notes: Another popular Irish session tune. Standard tuning. Bit of a workout in the B part, but worth the effort. Notes: This is my arrangement of Morrison's for clawhammer. Notes: A transfer of Kevin Burke's GP5 version to tabled it. 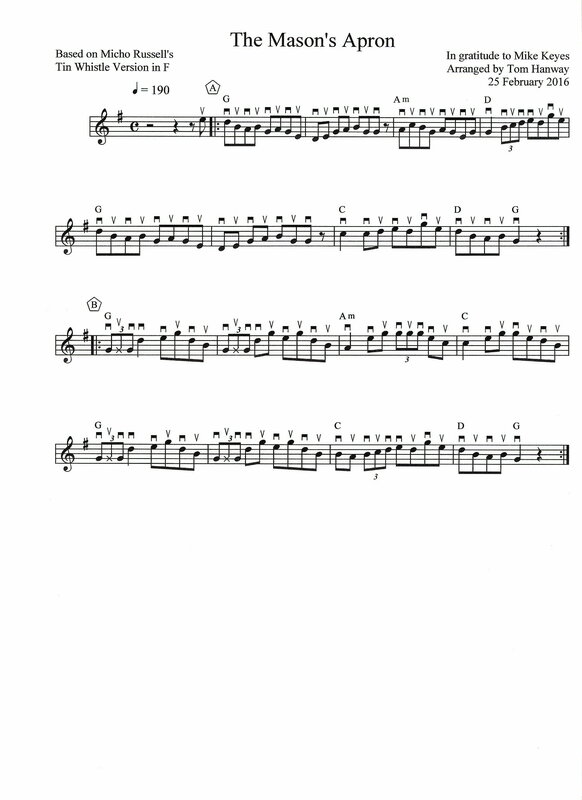 Notes: French Canadian fiddle tune. Mostly single string in the A section then a bit more melodic in the B. A lot of fun. Notes: A Quebecois tune popular in the Olympia session. Inspired by Allison de Groot's accompaniment of Adrianna Ciccone on Adrianna's album 'The Back of Winter' (it's the first tune in a medley they call 'Two old times'). Sheet music is in the Portland Collection, volume 1. Notes: Count up 4 frets from the barre to get in position. Notes: Mr Sandman was recorded by the Chordettes in 1954, although it had previously been recorded by Vaughn Monroe -- no relation to Bill Monroe, I think – and his Orchestra in the same year. Steve Arkin has stated that Bill Keith had an arrangement of the song in the early 1960s, although I have never heard Keith’s version (and would love to, if anybody has a recording). 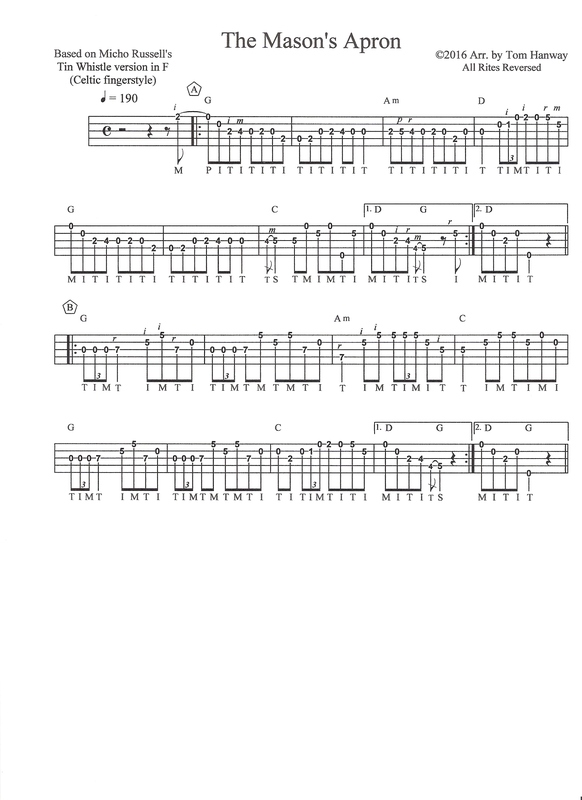 In any case, several years ago I finally worked up an arrangement of my own, and I just got around to the tablature, posted here. It took me about one month to tab it out – a real pain – but I think I finally got it close to right. I borrowed the idea for the ending from an excellent tab by Jack Gentle Jr. (aka MickG) that was posted in the Tab Archive some years ago, and I gratefully acknowledge it here. When you work through the tab, you will find unusual D13 and D7 chord positions in measure 24 and elsewhere. Here I made use of Sonny Osborne’s brilliant creation of a pedal steel–like chord progression that he demonstrates in his Homespun Tapes video. Notes: A tune I wrote for a pet dog we once had, his name was "Spike", and he managed to reach the ripe old age of 21 (human years) and from then on we called him "Mr Spike"as respect, unfortunately he passed away shortly afterwards. Notes: Judith Maxwell was a "planxty" written by the blind Irish harper Turlough O'Carolan. I believe it's the most upbeat tune of his I've learned. 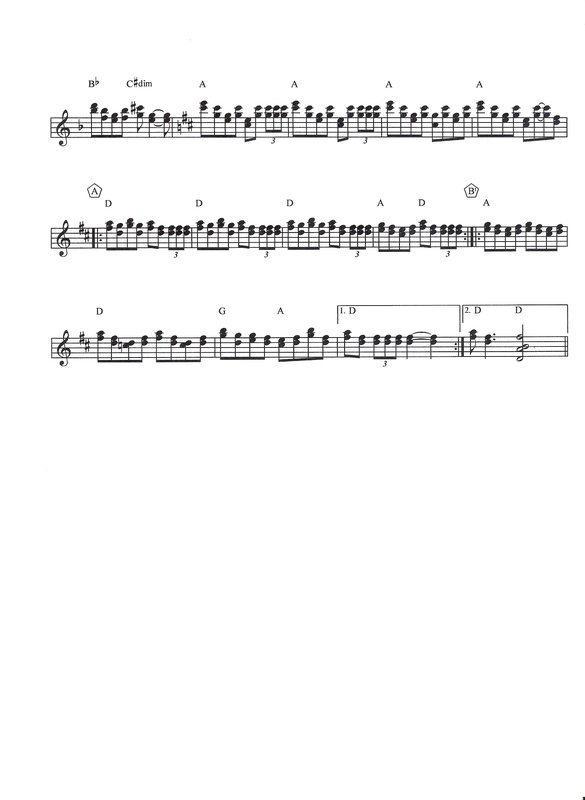 Notes: Originally composed by Simon Jeffes of the Penguin Cafe Orchestra in the key of C. This version has been transcribed from the cover version by Irish trad group Patrick Street in the key of D. Guitar Pro & PDF versions. Notes: Originally composed by Simon Jeffes of the Penguin Cafe Orchestra in the key of C. This version in G is based on the cover version by Irish trad group Patrick Street who played it in the key of D. Guitar Pro and PDF versions. 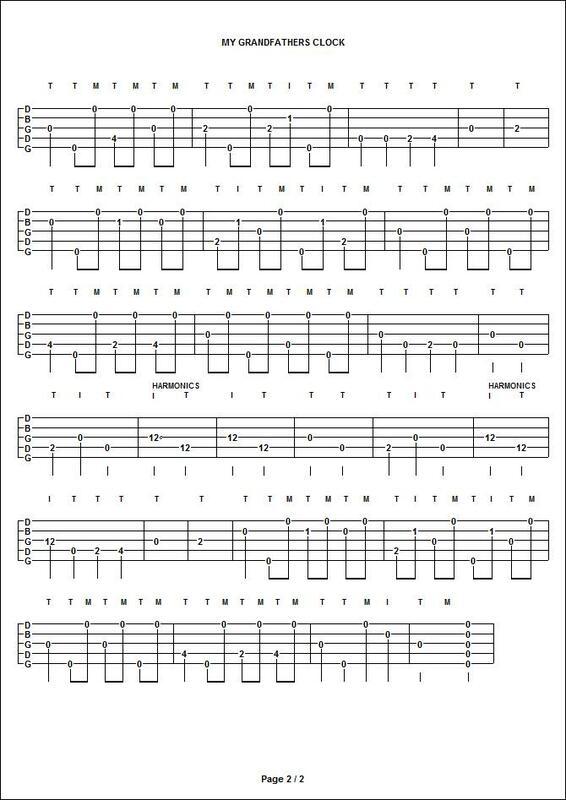 Notes: When I heard this, just had to get it in tab form. 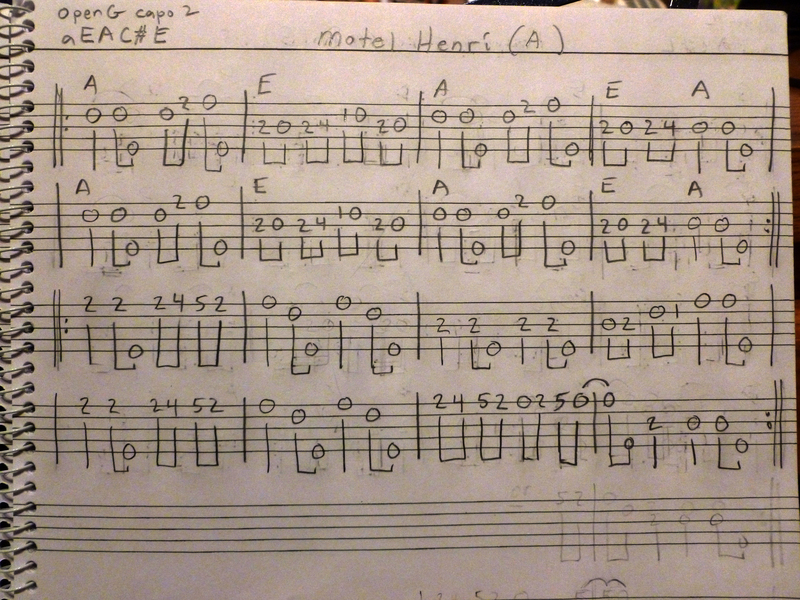 Was given this easier version in note format and have transcribed into tab (an octave higher). Tab and notes on the sheet. My first submission to the tab collection. I hope you like and comments welcome. Dave. Notes: This quirky tune from the Penquin Cafe Orchestra has found its way into mainstream Irish and Celtic music as a reel. I've put it back to its original keys, and it can be capoed up two or four frets. Notes: I now have a harmony part for this, tab to follow. I had put it back to its original keys, and it can be capoed up two or four frets. 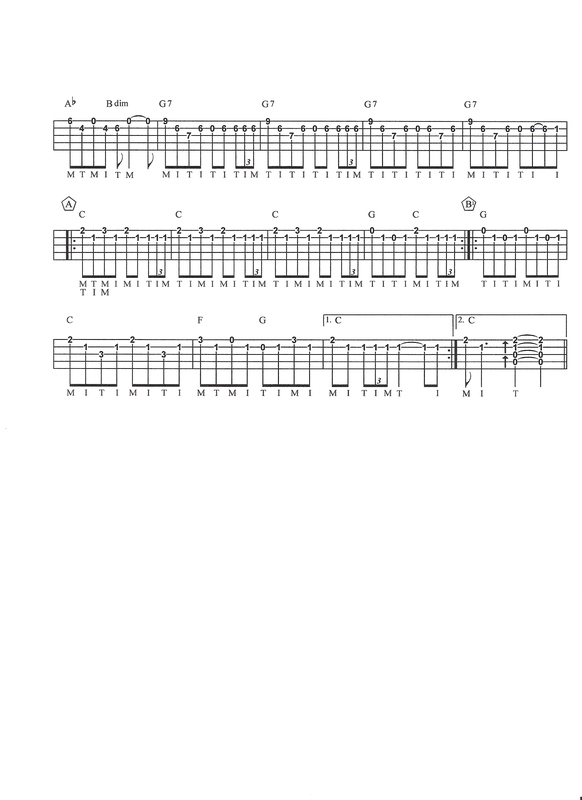 Start with capo 2 for Irish Trad sessions because it begins and ends in the key of D. It's easy on the 5-string, and it’s a fabulous tune closert, a real crowd-pleaser. It works for Sharon Shannon among others. Notes: Music for a Found Harmonium (Harmony), pages 1 and 2. Notes: Here's a snapshot standard arrangement that matches my tab of the same tune based on the original Penguin Cafe Orchestra version. Notes: Here's a snapshot tab arrangement that matches my standard version of the same tune based on the original Penguin Cafe Orchestra version. 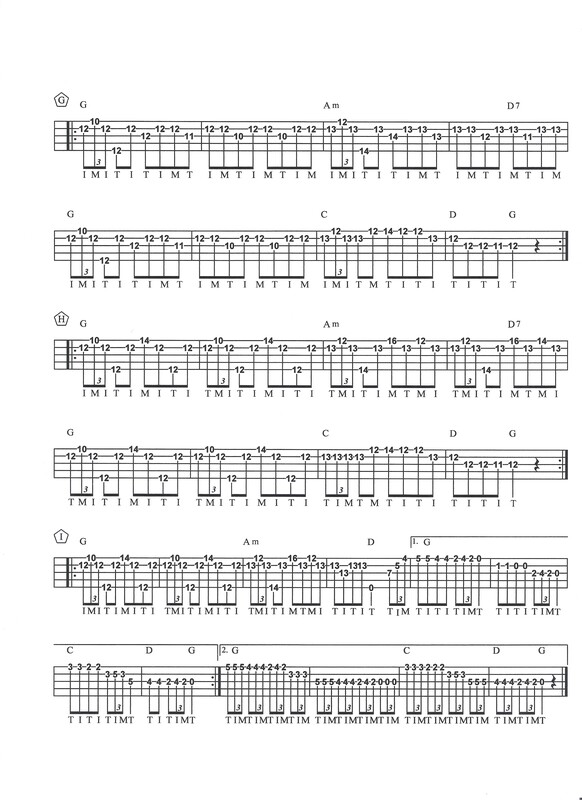 Notes: I play this on the 5-string in a dropped C-tuning, capoed up two frets. But it works on tenor banjo, and a variety of tunings can be used. Which instrument and tuning suits your style best? 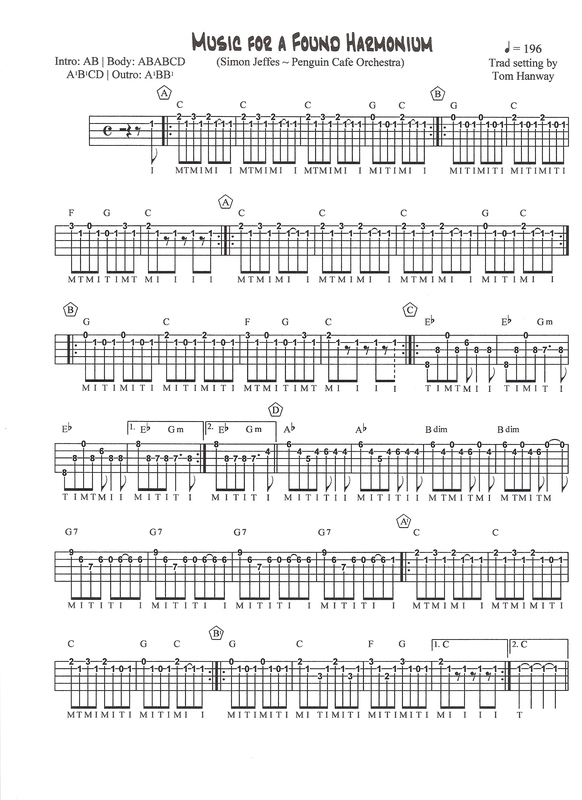 Notes: Now popular in Irish trad, this setting is based on Sharon Shannon's version. Notice the trebles. Notes: I worked up this tab of Don William's sentimental ballad in response to an appeal in the Tab Request forum. Here's the link to the discussion: http://www.banjohangout.org/topic/273079. The OP described himself as a novice, so I kept the banjo at a beginner/intermediate level. You do need to know how to move around up the neck with your basic closed chord forms, and it helps if you are a soft-hearted old goat, like the OP and I. I based the back-up very loosely on what the piano and guitar are doing on the video that was posted in the request thread. Notes: A fun and easy bluegrass-style song I wrote for beginners. Notes: A simple clawhammer tune for beginners (with just a touch of drop thumb). Dedicated to my twin brother, Matt, the shirt maker. Enjoy! Notes: This is my five string banjo interpretation of Mother Maybelle's guitar break on the Carter Family's My Dixie Darling, recorded in June, 1936 for Decca Records. Note the ghost hammers- this involves hammering on the 4th string, 2nd fret with the left hand without picking it first with the right hand. There is also some Reno style single string phrasing on the D chord. Notes: This song is great, Capo goes on 4, tune 5th string up to A. I couldn't find a tab of it, so I decided to make one myself. I hope this helps some people. Feel free to make any improvements, like a more comprehensive tab for the guitar part too would be nice. Notes: Basic version of the tune emphasising the melody with the thumb - mostly 2 finger style. Notes: My first attempt at Grandpa Jones tune "Grandfather's Clock" with lyrics and a link to a YouTube version to play along with. To ge the timing and feeling for the song, you should listen to Grandpa's version. It is played in the Key of A, so Capo up from G tuning or tune up to A. I added a page 2 for complete lyrics and the progression Grandpa plays with alternate measures. The chime measures are included but not needed, as well as the Rest measures. Notes: I noticed there was not a version of this great song in the BHO tabs. Added this version that is not particular to any players break....just the way I play it. Notes: A wonderful song by Bill Emerson. Played in A with capo. Notes: "My Yellow Ginger Lei", basic version with variations from Dr. David Heaukulani's book "Ukulele Slack Key, Hawaiian Slack Key Styling"